Welcome to the "Salmon Speaks" website. It is a site where ordinary becomes extraordinary. It is a place where our children are the educators and we are the students. "Salmon Speaks" of how the extraordinary journey of the salmon motivated children to speak out loud to the people in the world. What is their message? We cannot continue to ignore what our actions are doing to our earth and to the creatures that inhabit this earth which is their home too. Along with this message is the point of view people have that children are "innocents", unable to comprehend issues that adults might struggle with, that children need to be protected and cared for, that children can't understand. The website will share with you "ordinary moments" like the "Salmon Speaks" and "Real Indians" that show children involved in thoughtful discussions and coming up with powerful insights into difficult human issues. As we all know, children are at the beginning of their journey of learning and so there are many things that catch their attention throughout the days that provide opportunities for exploration, theory making and for new understandings. This website will share some of those moments of exploration. The final purpose of this website is to address the perception that early childhood educators are simply "baby sitters". We will share some of the ways that early childhood educators support children's journeys of learning by using pedagogical documentation and learning stories. Whether it is a powerful issue of social justice, an overwhelming fear of the unknown, or an inquisitive approach to what is living under a clump of earth, the early childhood professional can assist each child. We hope that the "Salmon Speaks" website will give others an opportunity to observe and learn from children and their educators. Like the salmon's final act of generosity as it lays its eggs to begin morejourneys of life, we also invite children and the significant adults in your lives to share your thoughts and experiences by contacting us. We look forward to hearing from you. Learn more about our educators. A project initiated by the children of Valhalla Children's Center in Slocan, B.C. and Wee Ones in South Slocan, B.C. The children wished to share their concerns about the loss of the salmon's habitat by the construction of dams on the rivers. They wanted to speak for the salmon. Also to change the general perception that people have about children, the "Salmon Speaks" project speaks for the children. This project presents the children's concerns, views, and messages to help the salmon return "home". The children of Valhalla and Wee Ones are proof that children can understand environmental consequences to one's actions and they want to do something about it. Supporting the children and their strong sense of empathy and justice in their endeavors, are the early childhood professionals who care and work with the children. "Salmon Speaks" for their profession in educating the public about their role in your children's lives and in this society. They are the experts in the early childhood field, as doctors are in health care, as mechanics are in "auto" care. 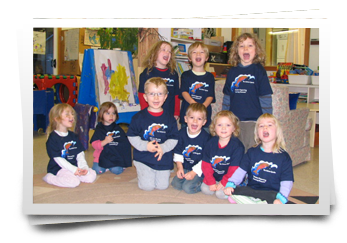 In 2009, the Early Childhood Educators of BC (ECEBC) with funding from VanCity Community Foundation, selected the "Salmon Speaks" proposal as one of nine projects throughout the province of BC to be part of the Leadership Initiative Community Project. Their goal is to support the leadership capacity of early childhood educators in B.C. Specifically with the "Salmon Speaks" project, it is to help change the community's view of children as not just innocents, but as important and contributing members of society. Beginning with their home communities, the early childhood educators helped the children share their concerns and suggestions with their families and friends. The next step took them into their communities using business cards, brochures, posters, graffiti boards, and placemats at a local restaurant to spread their message. "Salmon Speaks" displays were set up and shared with a wider community of people when educators participated in family faires, a barter faire, conferences and workshops. The children's message traveled across B.C. and all the way down to Grand Coulee. Attempts were made to contact radio stations and newspapers. The final step, to take the voice of "Salmon Speaks" to the world, is by this website. We gratefully acknowledge ECEBC and VanCity Community Foundation for providing us the opportunity to create this website. The "Salmon Speaks" website was possible with the financial assistance from VanCity Community Foundation and the ECEBC's Communities of Innovation Leadership Project.